Office Depot Toner cartridge. Compatible with HP CF211A. Suitable for HP Laserjet Pro 200 Color M251 Color MFP M276. Page yield approx. 1.800 pages. Colour: cyan. Office Depot toner cartridge CC533A. Page life: 2 800. Colour: magenta. Compatibility: CP2020 Series CP2025N CP2025DN CM2320 MFP CM2320XFI MFP CM2320N MFP CM2320NF MFP Canon LBP7200 Series MF8330CDN MF8350CDN. 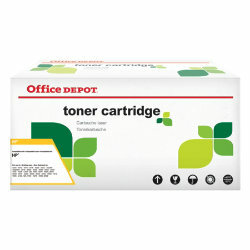 Office Depot toner cartridge CE505A. Page life: 2 300. Colour: black. Compatibility: HP P2035 P2035N P2055D P2055DN. Office Depot toner cartridge CE253A. For up to 10.500 sheets maximum 5% coverage. Colour: magenta. Compatibility: HP Color Laserjet CM 3530 FS MFP CP 3520 Series CM 3530 MFP CP 3525 DN CP 3525 N CP 3525 X CP 3525.